MUMBAI, India - Global stock markets were uninspired by an upbeat report on the U.S. economy, with most drifting lower Thursday after the U.S. Federal Reserve said it would make further cuts to its monetary stimulus as expected. Investors are now reckoning with an expiry date for the lavishly easy monetary policy that has underpinned gains in global stock markets for several years. 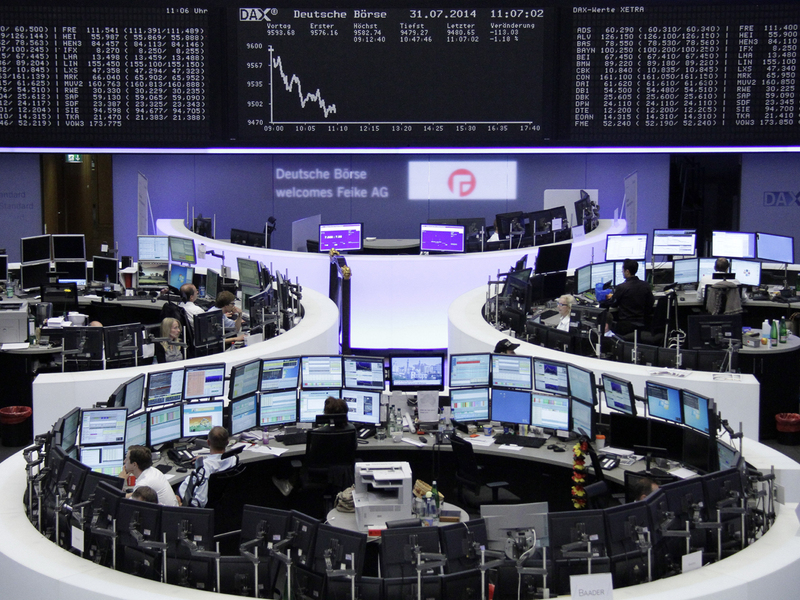 Europe got off to weak start, with Germany's DAX down 0.7 percent to 9,529.44. Britain's FTSE 100 eased 0.1 percent to 6,763.65 and France's CAC dropped 0.5 percent to 4,289.87. Wall Street looked set to have another lackluster day. Dow Jones futures were down 0.4 percent to 16,747 and S&P 500 futures shed 0.5 percent to 1,955.10. Tokyo's Nikkei 225, the regional benchmark, closed down 0.2 percent to 15,620.77 and South Korea's Kospi shed 0.3 percent to 2,076.12. The Hang Seng in Hong Kong gained 0.1 percent to 24,756.85 while China's Shanghai Composite added 0.9 percent to 2,305.21 ahead of manufacturing data due Friday. Australia's S&P/ASX 200 edged up 0.2 percent to 5,632.90 and India's Sensex was off 0.2 percent at 26,032.04. Shares of South Korean consumer electronics kingpin Samsung dived 4 percent after it reported a bigger-than-expected fall in second quarter profit on slowing smartphone sales. Cheaper upstarts such as China's Huawei are eroding its market share in developing nations and Samsung was uncertain if smartphone earnings would improve this quarter. April-June quarter net profit dropped 20 percent to 6.3 trillion won ($6.1 billion). Federal Reserve policymakers said the central bank would make further cuts to its monthly bond purchases, a program that is intended to keep long-term interest rates low and encourage borrowing and spending. At the current pace of cutbacks, the Fed's bond purchases will end in October. The U.S. economy expanded by a better-than-expected 4 percent in the second quarter after a severe winter hit the first quarter's growth. Even so, it was a robust outcome for the world's largest economy. Jack Ablin, chief investment officer at BMO Private Bank, said the strong U.S. growth report failed to inspire enthusiasm in the stock market because higher growth and the prospect of inflation will force the Fed to raise interest rates sooner rather than later. "Good news is getting to be bad news again," Ablin said. "The GDP report is obviously good news, so why are stocks off? Because people are wondering when the party will come to an end." It's a busy week for economic news. There's a report on China's manufacturing industry out Friday, and the U.S. Labor Department releases its monthly jobs report the same day. Benchmark U.S. crude for September delivery dropped by $1.01 to $99.26 a barrel. After running up to $107 in June, it has steadily fallen back as fears of supply disruptions from Russia and the Middle East ebbed. The euro strengthened to $1.3396 from $1.3995 late Wednesday. The dollar inched up to 102.88 yen from 102.86 yen.